When it comes to drum sounds, sometimes the smallest details can make a big difference when you consider that there are usually multiple mics involved. Changing one thing can sometimes make a difference, but sometimes it's the fact that many small adjustments have a cumulative effective on the overall sound. Here are 7 tips culled from The Recording Engineer's Handbook 3rd edition that can individually or together improve your recorded drum sound. 1. Microphones aimed at the center of the drum will provide the most attack. For more body or ring, aim it more towards the rim. 2. The best way to hear exactly what the drum sounds like when doing a mic check is to have the drummer hit the drum about once per second so there’s enough time between hits to hear how long the ring is. 3. Try to keep any mics underneath the drums at a 90 degree angle to the mic on top to keep the acoustic phase shift to a minimum. 4. Most mics placed underneath the drums will be out of phase with the tops mics. Switch the polarity on your preamp, console or DAW and choose the position that has the most bottom end. 5. 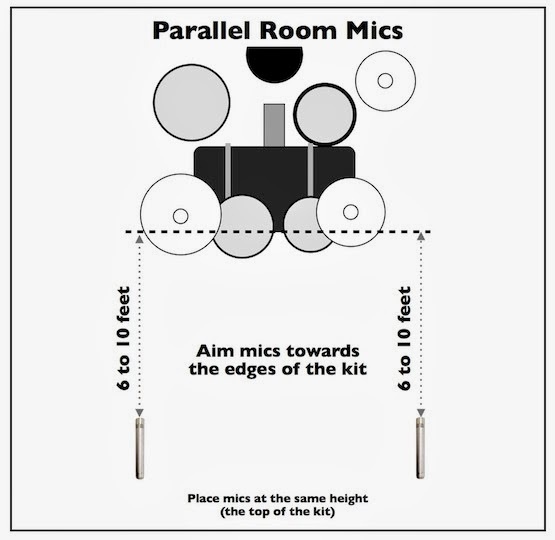 Try to keep all mics as parallel as possible to keep the acoustic phase shift to a minimum (see the graphic on the left). 6. The main thing about mic placement on the drums is to place the mics in such a way where the drummer never has to be concerned about hitting them. 7. The ambient sound of the room is a big part of the drum sound. Don’t overlook using room mics where possible (see the graphic on the left). The above tips can generally apply to just about any drum miking setup, but remember to listen carefully after each adjustment to note the difference, if any, that occurs, then make sure it fits with the track. You can read additional excerpts from The Recording Engineer's Handbook and my other books on the excerpt section of bobbyowsinski.com.